January 2011 is an awfully exciting month for Verizon Wireless employees and customers. At CES 2011, the company announced several 4G LTE phones including the Motorola Droid Bionic and the HTC Thunderbolt. Just a few days after the largest tech week of the year, Verizon Wireless announced details about the Apple iPhone 4. With many great choices, selecting the phone that works best for you can get awfully overwhelming. Fortunately, we’re back with yet another infographic with an in-depth look at three of our favorite upcoming Verizon Wireless smart phones. We hope that this will help you find the device that best fits your daily needs. If you have any questions, feel free to ask below and we will try to answer them the best we can. If you like this, feel free to share this with friends and family. We even have a convenient share box off to the right. If you found an error or have suggestions for improvements, feel free to let us know. you could also mention processor power, and RAM. Definitely will add rows for CPU and RAM in the next infographic we do. We’re thinking of comparing some new tablets such as the Motorola Xoom and BlackBerry Playbook. Any suggestions for specific models? I was looking at getting the Iphone 4, but they are going to come out with the iphone 5 in a few months. I went to sprint and played around with the HTC EVO and I really like it. I am looking at geting the HTC Thunderbolt. The only thing that draws me to the Iphone 4 is the screen resolution. I don’t like the closed offness of apple. I like everything else about the HTC. Is the screen resolution that noticeable? I happen to own a HTC EVO and I am someone who thinks it is better than the iPhone 4. However if screen resolution is an important factor in your decision, you should know that the iPhone’s display is significantly better. The iPhone has nearly 330 pixels per inch while the HTC EVO only has about 217 pixels per inch like the Thunderbolt. Apple always uses IPS panels in their devices. These have better colors and viewing angles compared to standard TFT displays. However, keep in mind that you probably won’t notice much of a difference unless you are geeky enough to care or if you are comparing both devices side-by-side. Be sure to tally up the factors that are important to you before buying a phone. Is the home button not a dedicated touch key? No. It performs other functions as well. Therefore, not dedicated, unlike the volume buttons. the volume buttons can also be mapped to user specification. for example, on mine, press up, volume up, hold up: toggle flash LED, press down: vol down, hold down: remove all native backgrounded applications, press up then down: toggle SBSettings, press down then up: switch to last switched native background enabled application, press and hold both up and down: respring into safemode. I also have an HtC Glacier. it’s buttons can also be configured. I’m sure other android based handsets can also not be ‘dedicated’ as per Users needs. Can you tell me why , even though iPhone was the worst of these three, I still want it the most? The iPhone clearly wins, but that’s only if you don’t think about it. Because if you do actually think about it, Bionic/Thunderbolt completely destroy iPhone 4. Because of the iTunes App Store. Well considering the iphone 4 came out light years ago in computer time ago, and is still comparable to these devices is something, Apple usually devastates the phone market so who knows what the iphone 5 will have although HTC is pretty impressive as well. Mostly I would say because of the name brand. Since Apple is portrayed as the best brand in technology, then that is what make consumers like them the most, even though they do not always come out on top with the best technology… Hope I answered your question for you. This infographic is pretty but makes some pretty questionable comparisons.Why are you comparing the iPhone 4 (which is Mid-2010 hardware) with the latest Android phones that have yet to be released? Both these phones are not out yet and aren’t hitting stores particularly soon anyway. They’ll be spending most of their time on the market competing with the also-unreleased iPhone 5. Obviously you can’t make an infographic with iPhone 5 information on it, but keep in mind that these phones won’t be going up against the iPhone 4 for very long.Also, you guys are really giving the iPhone an X for not having the 4 Android buttons (home, back, menu, search)? It runs iOS, not Android, so it doesn’t need them. This is a matter of UI design. If you did an infographic comparing Windows Phone to Android, would you ding Android for not having a dedicated Windows button? But want to know the reason we keep comparing to iPhone? It is still one of the best selling smart phones out there. There’s no single Android device that has beat it in sales or even come close. However, the Android platform as a whole has already begun to dominate according to comScore ( http://goo.gl/E6UU9 ). it’s not the maker of the info graphics fault that apple hardware is outdated and releasing a 3g phone at the same time as android 4g phones on verizon. also, iphone 5? did i miss apples official launch of it? oh wait it’s probably 6 months to a year behind htc/samsung/motorola. but i guess that’s just speculation, it could not even exist.on a more positive note, i love the graphic, my contract is over now (in february, not july or whenever apple gets ready to release the iphone 5/4g) and it clearly shows the pros and cons of verizons phones being released in the next month or two. Excellent graphic. Clear and easy to understand! But one question: why is it that with a greater battery capacity, the BIONIC has a shorter standby time than the Thunderbolt?.. Is the BIONIC less “efficient” or something than the Thunderbolt? Just wondering! Thanks! I was really looking forward to the HTC Thunderbolt.. and got really really excited when it was hyped pre-CES (leaks about dual core cpu and the like) and was sad when I heard it was single core. Its still an amazing phone– I guess I was expecting unrealistic things! At this point, I’m leaning towards the BIONIC to upgrade to from my — gasp — BB. But there’s still time before my contract is up— hooray for WMC in a few weeks! Simply having a larger battery doesn’t necessarily mean better battery life these days. The dual-core processors are actually more efficient in most cases since they can scale to using two cores when needed and back to a single core when idle. In addition, the Bionic has Tegra 2 which as an integrated GPU that also helps save power when computing graphics-intensive tasks. Pretty much, each device needs to be evaluated separately to determine how long it can run on a single charge. P.S. I was hoping for dual core in Thunderbolt too, I even heard a ridiculous rumor that there was a 5 mega pixel front facing camera. Thanks. This is a great chart. How did you come up with the battery lifetimes? Also I understood that the Iphone didn’t have an LED? We got the battery life estimates directly from the fact sheets that were provided to the media by the respective companies. They could potentially vary or be somewhat inaccurate in everyday use. Nice comparison, even if it’s just hardware based. I’m really looking forward to the HTC Thunderbolt. If Verizon had gotten the iPhone a year ago, I would have bought one without hesitation, but Android is becoming a very viable option, even for a Mac user like me =) We’ll see how the iPhone 5 stacks up before I buy, though! PS: Wasn’t there a way I could comment through Facebook before, as opposed to typing all the “Name” Email, and Website fields? We did have Facebook Authentication before, but we temporarily killed it when we revamped to Skatter Tech 3.0. 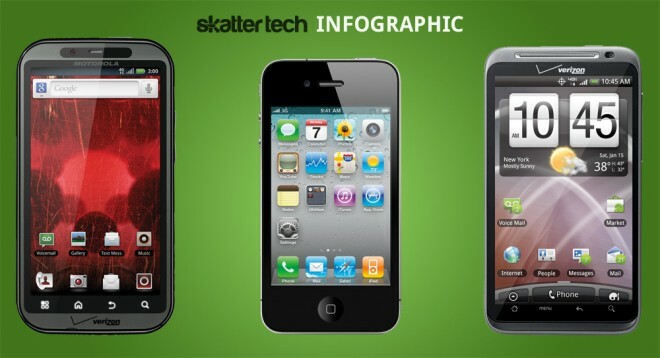 ( http://skattertech.com/?p=13598 ) We are working on some upgrades and will bring it back along with authentication support for other social networking services as well. How about a new comparison when the iPhone 5 is out and these new android handsets get some real world usage? I read on another blog that the iP5 will be a totally new design….only Mr. Steve knows for sure!I have an unlocked iP4 and find it pretty good….a bit clunky physically so looking forward to seeing the 5. In Hong Kong where I live, the iPhone is sold thru multiple carriers and seems to have supplanted Nokia in terms of smart phones for consumers (anecdotal evidence of seeing what people are using on the bus). It is everywhere and why not when free on a 2 year contract at $40/month? The big screen android phones would be far less popular IMO if the iP4 was sold in the US like it is here: unlocked or thru multiple carriers. We make these on a fairly regular basis, assuming that there is something new to compare. We will definitely put something together for the next generation iPhone and the latest Android devices available then. P.S. The Thunderbolt and Droid Bionic were actually pretty slim. It’s not as slim as an iPhone, but not bulky by any means. I completely agree with the comment asking why are you comparing a 2010 phone to somethin not even out yet? Also, i think consumers realize that its not just a phone with hardware, but an entire user experience: user interface, occurrence of errors, working apps, sync capabilities… I am a droid x owner and have had an iphone 3gs since it was released. The apple infrastructure is what i love. Also, every app i download works and all my issues have been resolved in a timely manner…. it is the infrastructure! Even as i type this on my droid, it does not center the screen and kkep the text on the screen properly. It is the simple things that my droid does do, BUT no where near as efficiently nor consistently as my iphone of two years ago does. every app on the AppStore is not guaranteed to work, and all it takes is a cursory stroll through the review section of any application to prove that. from my experience, dev response and bug releases do happen fairly quickly. Although app crashes are rare due to the approval process and the procedure each one has to go through…they do happen. apple is customer experience focused, that is true. the OS lifecycle is mature and proven. Android is still young and has some issues, however the time to maturity will not take long because it has a a path to follow and a long list of mistakes that it’s competitor made, and can avoid them if desired. androids biggest issue is fragmentation and OEM control. but Google sees this as a benefit rather than a problem. googles objective is market saturation rather than user experience. Since the cost of abandoning a handset under contract is considered too much for many consumers…android users focus on what fixes come in the next firmware update, and google leaks just enough to keep them focused on what their experience might be like next quarter, rather than lamenting on they are stuck in frustration at the moment. IPhone 4 does have many apps with turn by turn directions. MapQuest is even free. Yup, but we are comparing “out of the box” features. We had to draw a line somewhere. How about comparing the e-mail push? I’m a Verizon BlackBerry user now (the Tour/9630), but the Bionic is REALLY tempting. I’ll give you that one, and apologies for not being clearer, this being my first post here. I SHOULD have said “quality of push” and also specified I am interest in POP3 rather than Enterprise, my company being rather small. I can assure you that they all have POP3 as well. However, it might not be push if you are doing POP3. Having either Exchange or Gmail will offer push. Other types will probably just check at a regular interval for new messages. POP3 isn’t push, it’s POP. Your device needs to check for emails at set intervals, which kills battery life since it has to connect to the mail server, login, check for messages, download headers, logout and disconnect. Push only connects when the device has been notified that there are messages awaiting on the server. Sahas is right, If you have Exchange at work you can configure it for Push (or your network admin can) or use the Gmail app which uses push. If your work email is using POP3 or IMAP, it is not using Push. although IMAP can support a notifying you that there are new emails on the server if you choose to download them. The latest facebook app on Android also gave the phone push for notifications, although it doesn’t always work. Thats a ridiculous comment to say its time to upgrade if you are on a blackberry. There is no true push email in any of the mentioned devices unless you use gmail or Microsoft Exchange. For Yahoo and other accounts you have to check it at a certain frequency in order to get it…I find this a big drawback. The other thing is that I had an Epic 4G and went back to my Blackberry 9700…the main reason was the awful battery life for most of these Android devices…with my BB 9700 I can have GPS on, Blue tooth on, wi-fi on and still last more than a day, sometimes a couple of days without charging. The other big thing I noticed is that I can type much faster on the BB keyboard vs the virtual even with Swype installed. I noticed I was having to go back to my computer to reply to longer emails and thats when I realized these don’t work for me. Do you also know that if you are overseas and trying to roam on a data plan its very expensive, thats where BB is very handy since it does not use as much data as these smart phones and the data is compressed. There are many reasons why someone would prefer a Blackberry over any of these devices…lets have some objectivity. If you are a Yahoo Mail user, there is an official app available for accessing email which includes true C2DM push. But yes, you are correct. The native Gmail app also pushes new messages to your phone, but the server only checks ever 30 minutes. If you use the included POP3/IMAP client, that also only syncs on a periodically. I had a chance to review the Epic 4G last year and the battery lasted for almost a full day on a single charge. The new Froyo update apparently just came out, so that will help improve battery life as well. Traditional BlackBerry phones last a much longer, but it isn’t because they are necessarily better phones. Flip phones can last an entire week on a single charge. RIM turns emails into plain text on most of these devices, which is great for those looking to save data. (Rich text HTML emails are generally poorly formatted.) It also lasts longer because people consume less data due to its limitations. I find that I use the web browser regularly on my HTC EVO when I barely would on an older BlackBerry Bold. It truly comes down to what you need, but the majority of consumers will likely benefit from the many features Android/iOS smart phones offer over BlackBerry devices. I find it funny that anything the iPhone beats the Androids in, you put in big bold print. They do that with all the “winning” phones (see hotspot, max storage or even screen size and camera res), I’m assuming you’re talking about the number af apps which is where you see the largest discrepancy across devices and therefore the largest increase in font size. Not very helpful. Only the iPhone has iTunes. Hmmm – you consider that a negative or a positive? I think iTunes is one the worst pieces of cra(p) code I’ve ever experienced. Try RealPlayer. You’ll get far more control over your music. Did RealPlayer have some sort of major revamp I haven’t heard about? The last time I used it was over four years ago and it was complete bloatware at the time. I’m a huge fan of Foobar at the moment. Double Twist seems to be catching on, but I barely use it. Nice post. One question, where did you find the physical dimensions (and weight) for the Bionic? I didn’t see it on the fact sheet. Thanks! Hi Sahas – Great graphic. Are you sure though that the Thunderbolt will have swype? My amaetur search of various spec sheets online say that it will not. Thanks! I’m pretty sure that the pre-production unit I tried had Swype. HTC is pushing it to all their new phones and just about all the latest Verizon Wireless Android phones have it as well. Go with the other devices. The iphone is a bad phone. I’ll give up some resolution to be able to use a good phone. I have a iphone and let’s just say I’m a lot happier with my android device. Not to mention I’m not contributing to the death of my network because yes the iphone destroys networks…. considering that the majority of verizons customers are feature phone users, and AT&T has 4X the number of (aggregate) smartphone subscribers actively deployed on network than Verizon, your animosity is somewhat misplaced. when iPhone consumers (new and AT&T defectors) get on board with Verizon (and I hope the ditch AT&T in droves) verizons network will get douched as well…and yes, your android will be part of the problem. androids 0’s and 1’s aren’t any different than iOS 0’s and 1’s from a network infrastructure standpoint. the delta is total number of handsets that deliver high bandwidth requests, on the network. The Operating system of the handset is not significant. Leaving out the fact that the Bionic is dual core and the Thunderbolt is single core really gives a false picture. It makes the Thunderbolt and Bionic seem much closer in specs. I don’t really see why anyone would choose the Thunderbolt unless they absolutely had to have HTC Sense.. I’m a Droid Incredible user, but I’m fine with ditching HTC Sense for an extra core. you make a great point. I have tried to find system benchmarks that take into account all aspects of the mobile system architecture, but is common across both Android and iOS. I hope GeekBench get a port to Android so we can see how a4 and soon duocore a8, compete with hummingbird, snapdragon and Tegra2. sounds like an app opportunity. who wants to be a famous millionaire? I wish there were some way to compare the variety and quality of apps. Android may have “100,000”, but that’s sort of pointless to me since (1) I find far more ‘junk’ apps on Adriod than iPhone (look at Just In under Photography) and (2) some Android apps are really minimal compared to what’s available for the iPhone (video editing apps come to mind). I also would’t mind seeing a comparison of simple usability. For example, how do you take a screenshot, where’s the return/line feed key on the built-in messaging app’s keyboard, and do text pictures get screwed up by the messaging app’s formatting (yes, those are some of the many minor annoyance’s I’ve found when switching to Android :). the iPhone AppStore has it’s share of crapApps. The difference is Apple approved every one of them and the android market is less policed. however, the AppStore does have dynamic content depending on the iOS version and model of iDevice. the android market should do the same. AndroidLib is an independent company that estimates those numbers. We debated on whether to use that or not. We aren’t saying that number isn’t accurate, but we choose to use the last officially provided number straight from Google. Even all the latest CES 2011 Press Releases from HTC, Motorola, and Samsung stated 100k. P.S. The App Store number is also the last officially disclosed number from Apple. Distimo reports 300K to 130K, iOS to Android respectively. Arguing about the apps is kinda stupid anyhow since most of the apps are garbage. The most 90 percent of apps that most people use are on Android, IOS and Blackberry. Who needs a 1000 fart sound making apps anyhow? The HTC Thunderbolt has Adobe Flash? More than likely, any 2.2 android can run flash (free from the market) and all the new devices come with it pre-installed. Thanks Ian, this makes it clearer than plowing through a bunch of reports or getting opinions from people hoping to sell you “their” phone. Just for clarification: by “Hotspot” are you referring to tethering? Yes, it has a five person WiFi hotspot feature. No cables needed. If I use my Verizon phone as a hot spot and have 2 or 3 devices accessing the internet from it – will all of the usage for all the devices be unlimited ? If my kids use my phone for a hot spot – and they are both using their laptops – and let’s say it’s a 6 hour car trip to the Cape – will usage be unlimited or will I get a bill for thousands ? Thanks. Verizon’s mobile hotspot data is billed separately from the data for the phone ($20 over and above the regular data package), and there is a 2GB limit on the amount of data you can use for the subscription cost without incurring overage charges (I think $10 per GB overages). I would definitely research costs before letting two laptops access the internet for 6 continuous hours on it. Jason I read last week on Engadget Mobile that Thunderbolt will support simultaneous voice and data in LTE areas. Is that the same thing as what you’re talking about in your third metric? I wonder if the Bionic will therefore be able to do it too and we just haven’t heard yet because it comes out later. Like I wonder if it’s a feature of LTE rather than the various phones. With the iPhone 4 still being just 3G, it would still get a white star. Pretty much here is how it works: Verizon’s 4G network doesn’t handle or support voice calls. It is data-only. Placing a voice call on a 4G LTE phone will go through a 3G network. This means that if both networks are available, you can be on a call through 3G and using data through 4G at the same time. Simply having a 4G phone doesn’t mean it is possible, you actually need to have both 4G and 3G coverage for data + voice to happen at once. Verizon is being a bit sneaking when it comes to marketing this, but it is at least possible. Competing with the iPhone/iPad/iPod Touch is one thing. Competing with the iTunes App Store is a completely different beast.